A video gone viral in Korea shows an ajumma assaulting a grandmother who didn’t do anything to the former. 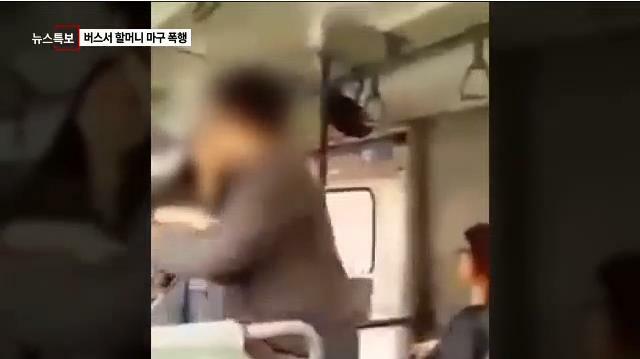 This incident happened on a city bus in Cheongju City in the province of Chungcheongbuk-do on April 28th at around 12:40pm. The video was uploaded on Facebook. In the video, the ajumma was seen shouting to someone outside the bus about a wallet. Then the grandmother sat beside her and and she told the latter to “leave her alone” and “go away” in a very disrespectful manner ~ which is a no-no in Korea. The ajumma slapped her victim on the head and told her to “go away” again. The grandmother moved to another seat but the ajumma chased and hit her again. A girl with a lollipop tried to pacify the ajumma by holding her hands. The netizens were impressed by her courage and has called her “ì‚¬íƒ•ë…€” or the girl with the candy. The grandmother was dizzy after being assaulted by the ajumma, who is obviously not mentally stable.